Whatever Happened To Old London Bridge? M@ Whatever Happened To Old London Bridge? There have been many London Bridges. The current, concrete span dates from only the 1970s. It replaced a 19th century bridge that was famously sold to an American businessman — much of that bridge stands to this day in Lake Havasu City, Arizona. But what of the medieval London Bridge? This structure crossed the river between the 13th and 19th centuries. You've no doubt seen images of this remarkable concoction. For much of its existence, what we now call Old London Bridge was overloaded with housing, shops, chapels and even a palace. Detail from a 1632 oil painting, View of London Bridge, by Claude de Jongh. Those buildings caused a supreme bottleneck. So much so that in 1722 the Lord Mayor instigated a 'keep left' rule for traffic — often said to be the origin of Britain's left-side driving. Eventually, the buildings had to go. The antiquated aquatic village was swept away in the 1760s to create a wider roadway. The bridge itself was also not long for this world. At almost 600 years old, it was increasingly tough to maintain. Its narrow arches were a major hinderance to river traffic. The whole edifice was removed and replaced between 1824 and 1831. But where do you dump many hundreds of tons of stone? It turns out that large chunks of Old London Bridge can still be seen around the London area, while other fragments are scattered far and wide. 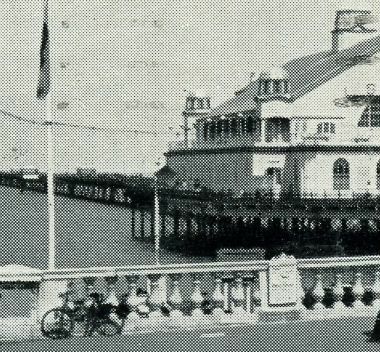 Much of the stonework was reportedly dumped in the river following demolition, and there are press reports of ships striking the sunken hazard. Otherwise, the medieval stone was reused in a number of properties. The most striking surviving example seems to be Ingress Abbey in Greenhithe, Kent (pictured by the author, above). Another significant lot of stone went to the Isle of Sheppey, to build the tower of Warden Church. Unfortunately, the structure fell foul of coastal erosion. What hadn't already been demolished fell into the sea about 100 years ago. The best-known remnants are the pedestrian alcoves, 14 of which graced the bridge in Georgian times, after the medieval buildings had been cleared from the roadway. Two of these distinctive shelters can be found at the eastern end of Victoria Park (one is pictured by the author, above). 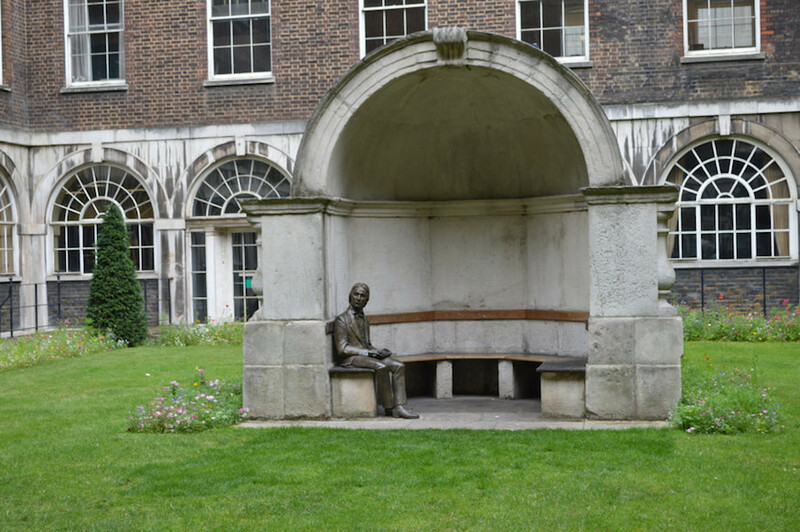 A third can be found in the modern London Bridge area — it's in the courtyard of Guy's Hospital, and is currently occupied by a seated statue of John Keats (see top image). 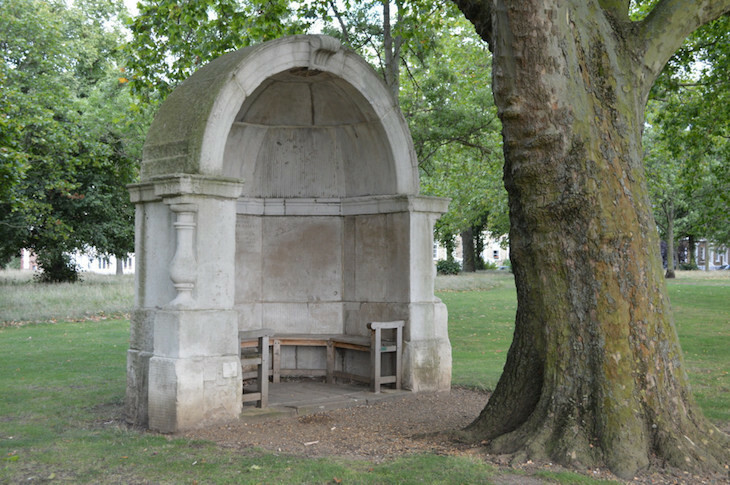 A fourth, and less well-known, alcove can be found in East Sheen, Richmond, where it once formed a garden decoration for a posh house (Stawell House pronounced, for some reason, as ‘shawl’). The house is long gone but the alcove survives, at the south-western end of the Courtlands Estate. A second niche once occupied the site, along with some balustrades from the bridge, but these were spirited away in the 1930s during construction of the estate. The stone was removed in 1953 following storm damage, its fate unknown. Perhaps chunks live on, somewhere in a Kentish back garden. There are hints online that further balustrades survive at Myddelton House and Gardens in Enfield, though we've been unable to verify this. An impressive stretch can apparently be found at Gilwell Park near Chingford. These balustrades look very similar to the Herne Bay structure. Forgotten survivals in Falkirk and Burton? 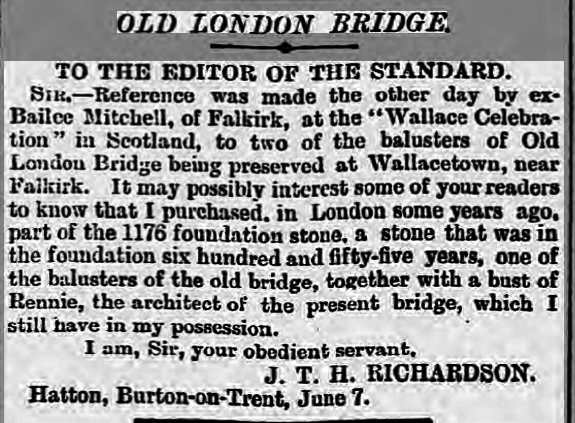 Here's a piece of Old London Bridge everyone seems to have forgotten... if it's true. We found this press cutting in the British Newspaper Archive, from Bridport News 1890. 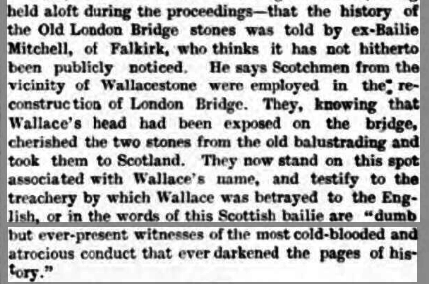 It describes how part of Wallacestone — a monument to William Wallace near Falkirk — is made from balustrade stone off Old London Bridge. It's an intriguing story, though does have the ring of an urban myth. That said, this response to the Falkirk story appeared in the London Evening Standard a few days later. Could the 12th century foundation stone still exist, somewhere in Derbyshire? Close to the alcove in Guy's Hospital, a second piece of bridge has found its way into Southwark. 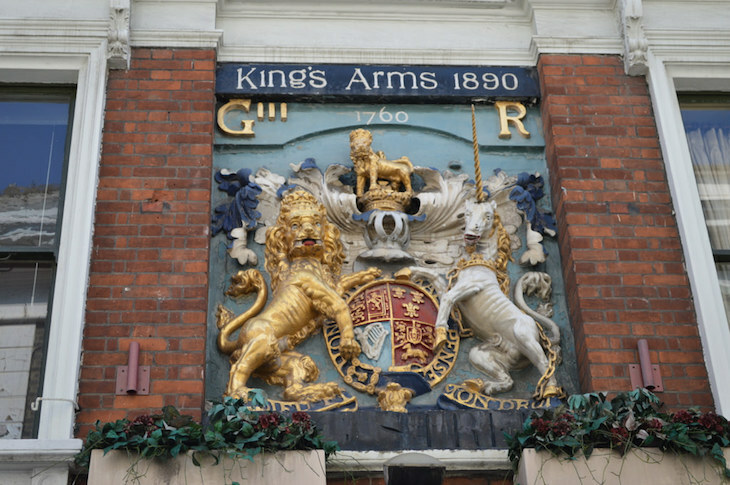 The quiet, unassuming King's Arms on Newcomen Street sports — appropriately — an actual set of King's arms, which adorned the southern gateway of the bridge from 1730 until demolition. After demolition of the bridge, the wooden piers and supports were chopped up and carved into mementos. Snuff boxes were particularly popular — an internet search yields many examples. An 1857 police report details the recovery of one such snuff box, stolen by a tramp near Bedford. A few years back, a table made from the wooden piles of the medieval bridge was sold at auction. Another (or perhaps the same) was acquired by the London Museum (now Museum of London) in 1917. Meanwhile, Fishmongers Hall, beside the modern bridge, contains an ornate chair made from the wood of the medieval span. The nearby Watermen's Hall has to make do with a simple fragment. 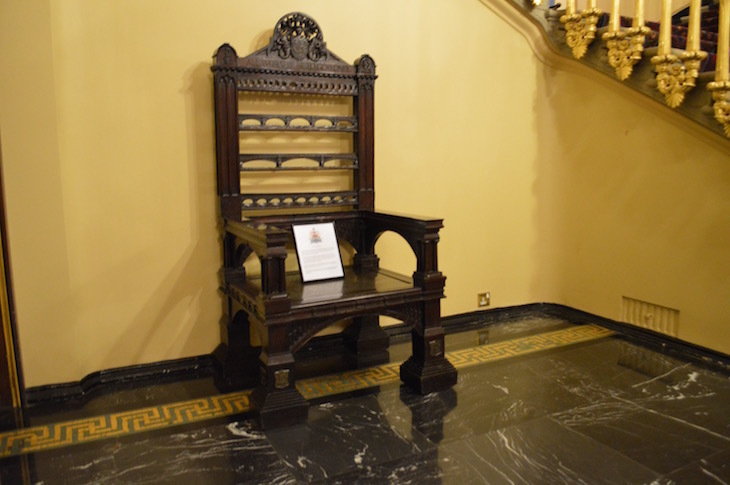 Chair at Fishmongers Hall. Note the three representations of the bridge in the back, including the modern bridge. 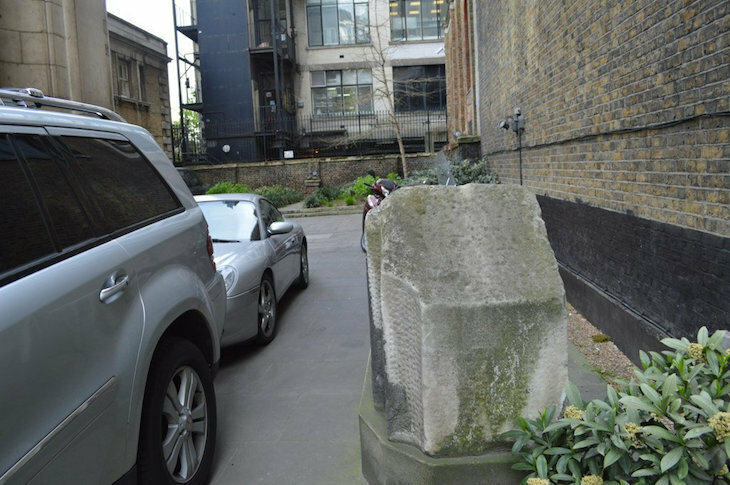 A collection of stones, thought to be from Old London Bridge, can be found in the courtyard of St Magnus the Martyr. The church once stood at the northern mouth of the bridge, and is full of historical reminders. Head inside to see a magnificent model of the medieval span, and don't miss the timbers preserved from a Roman bridge at this site. Other stones have been incorporated into properties on Heathfield Road, Wandsworth and (reputedly) the Woodberry Down development near Stoke Newington. Advertised in 1903. Wonder who bought them? Victor Keegan, who's been in search of bits of Old London Bridge for many years, reckons that this quay near Thorpe-le-Soken in Essex is built from old bridge stones. Coincidentally, this is the home village of William Gull, the royal surgeon better known as Jack the Ripper — at least in Alan Moore's From Hell. During the research for this article, we encountered many further, unverifiable examples. It seems that Old London Bridge is widely scattered but not entirely vanished. Perhaps one day, someone will reclaim some of that ancient material and redress the existing London Bridge with the bones of its ancestor. 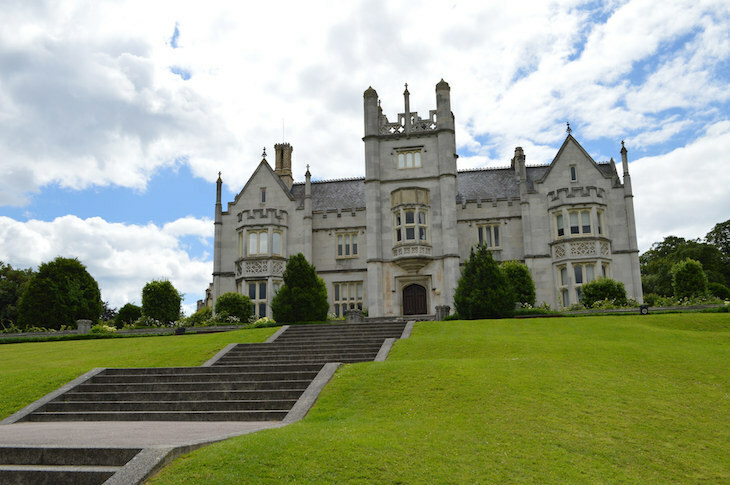 With thanks to Footprints guide Rob Smith for introducing the author to Ingress Abbey.